Your reviews editor has a rare capacity for hitting the nail squarely on the head. "A little belter" is how he described this CD and a little belter it assuredly is. "It" is a tiny sample of one of the most ambitious projects in the history of recorded sound; a one hundred plus CD re-issue of various anthologies compiled by the most prolific collector in the history of musical folklore. The project will be discussed in its various aspects by other people and on other pages of MT. There is therefore little point in dissecting the recordings, beyond saying that every aspect of Lomax's work seems to be here in roughly proportionate geographic representation. Thus, of the disc's thirty eight tracks, a third emanate from the United States, with the Caribbean, Spain, Italy and the British Isles all receiving substantial coverage. Other collectors and other locations feature also, chiefly via that early brainchild of Lomax's, The Columbia World Library of Folk and Primitive Music. Among them is a hauntingly beautiful Ma Uital Spre Rasarit (I looked toward the Rising Sun), performed by Maria Lateretu and accompanied by a plethora of instruments from her native Rumania. The Rumanian volume of that series is one which previously escaped me. If this performance is typical, then here is one omission I cannot wait to correct. As a quick, if very uneven, belt around the world's traditional music, the disc leaves the listener dazzled at the sheer brilliance of "humanly organised sound", as the late John Blacking once described music. I am fascinated at once by the diversity of that sound and by the way it all fits to a pattern. A choir of Longshoremen from the Genoan waterfront finds echo in a group of singers from the Georgia Sea Islands. Hebridean waulking women work at the cloth in a rhythm not vastly different to that chosen by a Mississippi work gang. 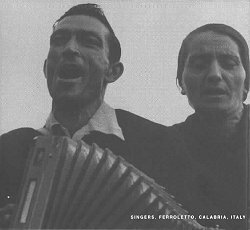 The Italian stornello performed by Eugenio Pila is still rolling around the ears when those two exponents of its Mississippi equivalent, Fred McDowell and Son House, take their respective turns. With such an array of material, assembled from such a long period of time, there are inevitable signs of age. Bound to Lose, from an anti-fascist ballad opera of Lomax's, emerges as a victim to outmoded taste. So do parts of the section covering Britain and Ireland. It is unfortunate that Seamus Ennis's familiar and, for this reviewer, undistinguished As I Roved Out is the sole witness of Lomax's endeavours in Ireland. The Columbia World Library Ireland LP was a rare gem indeed and reissue may be awaited with much enthusiasm. The booklet is wrong, however, in claiming that this track comes from there. It is from the Caedmon series, Folksongs of Britain. Even more disappointing is Ewan MacColl's extremely mannered Four Loom Weaver. Recorded long before he perfected his style, it may have been state of the art in 1951. Today it sits ill alongside Bob and Ron Copper's lusty and altogether more enduring Jovial Tradesmen. The disc is complemented by a seventy two page booklet, which outlines the series and which contains many interesting photographs of people whom Lomax has recorded. Unfortunately the performers shown in the booklet do not always tally with those on the disc. 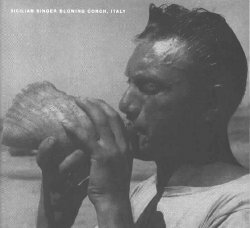 One would listen in vain for a Sicilian conch player, for Anguillan dancers, for a Spanish pipe and psaltery player and, most lamentable of all, for Texas Gladden. Mrs Gladden gets a mention as "America's greatest ballad singer" and she will duly take her place in the complete collection. A pity nonetheless that we weren't allowed to hear her in this context. The booklet also includes a useful article by Lomax. This contains much valuable biographical information, and is relatively free of the kind of sweeping assertion he is prone to make. I would like to know, though, what evidence exists to back up his claim that the choral songs of the Hebrides are 'pre-Christian'. 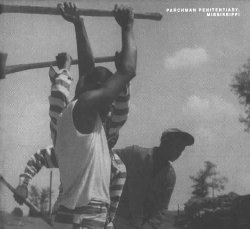 On the other hand I was brought up sharp by his account of the famous 1947 Parchman Farm prison recordings, for I had always pictured the convicts hacking away, stripped to the waist in blistering Mississippi heat. In fact they were recorded in a blizzard with six inches of snow! Even more fascinating is Lomax's account of his adventures in Spain. 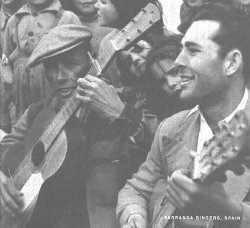 There he ran up against the strangest of bedfellows, for the Head of the folksong archive in Madrid turned out to be a former member of the German Nazi party. Despite this individual's success in denying Lomax any professional help, enough material came from that trip for Westminster Records to issue an eleven volume anthology. It has long been unavailable. 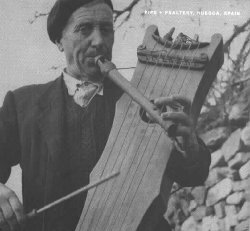 Yet, as the most comprehensive survey of Spanish folk music ever presented on disc, it is testimony to an unjustly neglected tradition, and to Lomax's abilities and tenacity as a collector. The sampler contains four items from that set and they are guaranteed to whet the appetite of any aficianado. I have always been a sucker for this kind of anthology, and for the message it conveys. Elsewhere in Musical Traditions recently, I have criticised Lomax's 'Cantometrics' experiment - the notion that folksinging style is the product of social culture - mainly on the grounds of poor methodology and excessive determinism. Still, there is no denying that the sounds of the human race map the culture areas of the globe in much the way that Lomax predicted. It must be so, for if it were otherwise, travellers in sound would not be able to negotiate their way around the world. Listen to the wonderful singing of the Saeta from the Easter procession at Seville and you cannot be anywhere but in Spain. Listen to Gender Wayang and there is no mistaking the sound of the Indonesian Archipelago. Listen to those Parchman Farm convicts chopping down trees and, snow or no snow, that's Mississippi. Yet this music speaks not just of the diversity of human sounds and cultures, but also of their intrinsic unity. There are obvious connections of course. The Alabama Sacred Harp Convention's performance of While Shepherds Watched is wonderfully redolent of the same song in the mouths of West Yorkshire carollers. There is also Spencer Moore's transatlantic rendering of the Irish ballad, The Girl I Left Behind. And there is black Sid Hemphill fiddling away like one of his white confreres. But it goes much deeper than that. Throughout Lomax's career he has spearheaded a Rousseauesque tendency which sees folksong as an agent of socio-political development. Change the songs a people sing, the message seems to go, and you change the feeling in their hearts. Logic decrees that it is the other way round. Song follows in the wake of change, it does not promote it. But there is one important way in which folksong can facilitate human progress; it can help us understand our fellow human beings. European culture is inherently intolerant of that which it finds to be different. We treat other cultures, other races, other musics, as both deviant from, and inferior to, our own. These songs do not need to be read as such. They are emotional statements, expressions of the human feeling within each and every one of us. It is true they are as multicultural as they are ethnically diverse, that is part of their splendour. But - however much the cultural facade may obscure the fact - we are all moved by the same things, and in the same way. What Lomax has given us is a means of realising this, of seeing the world's peoples as sensate human beings; as individuals we can empathise with, and whose songs we can share, rather than as racial stereotypes to be shunned and turned away from. This disc is a tribute to the work of Alan Lomax, and to the enterprise of the Rounder Corporation. It is a magnificent foretaste of what is to come, and it is a window on the world of music in its own right. Who will buy?. I doubt the young and uninitiated, for there are regrettably few nowadays who would heed the name of Alan Lomax. Nor, I suspect, will this sampler hold much appeal for mainstream folk record buyers. Strange how so many of the people who inhabit, or used to inhabit, our folk clubs shy away from anything to do with the real folk. No, the main appeal will lie with libraries and archives, and with seasoned collectors of traditional music records. That is where this disc really scores. It alerts you to what will be available that you haven't got already. How much of the series you will eventually want to buy depends on you, the listener. However, at current market prices the entire set will put you back only marginally more than one or two recent highly publicised Building Society share payouts. Lomax would dismiss such ballyhoo as part of "the success-motivated standards of our urban-condition consumer economy". As a stake in what's really important about the human race, I can't recommend a better investment than the recordings of Alan Lomax.